Meat stuffed peppers are the perfect dish for Sukkot when stuffed vegetables are traditionally served. They go nicely next to a roast chicken, elevating the menu to that of a Jewish holiday meal. 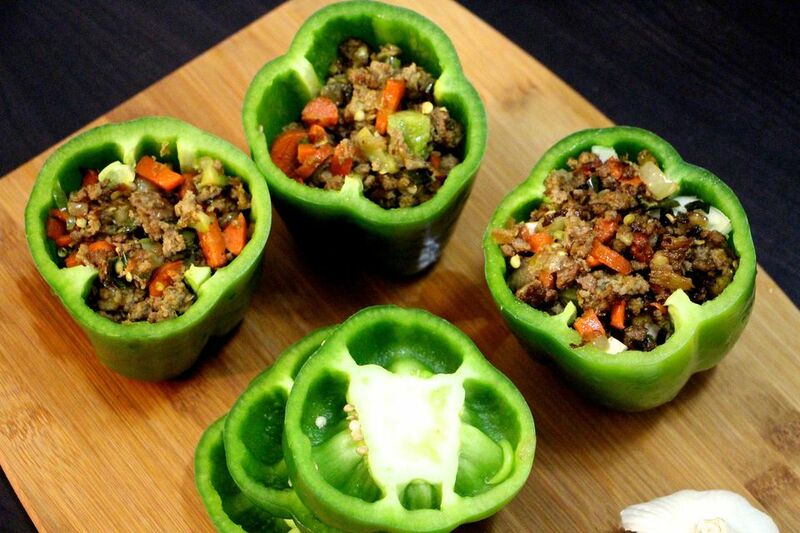 Use ground turkey instead of ground beef for a lite, healthy stuffed pepper. Stuffing peppers are much easier than stuffing cabbage leaves, and the resulting dish is just as delicious. Cut a circle in the top of each pepper and pull out the seeds. Rinse and set aside. Save the top of the pepper. In a bowl mix together the meat, grated onion, rice, egg, 1-2 tsp salt, and 1/4 tsp black pepper. Stuff peppers with this mixture. Stuff lightly, so they won't be too heavy and dense. Place stuffed peppers in a roasting pan. In a saucepan, heat oil and saute chopped onion until golden. Add all other ingredients and simmer for 10 minutes. Pour sauce over the peppers making sure that some of the sauce stays on top of the peppers. Place pepper tops back on top of the peppers. Cover and bake 1 hour, basting once or twice. Tip: Make in advance and reheat for the meal as the stuffed peppers taste even better after they have sat.